The following History Slam episode was originally featured on November 29, 2017. For the past three-and-a-half years I have had the pleasure of working with Jean-Marie Leduc and Julie Léger on a book looking at the history of skates. Mr. Leduc is a renowned expert on skates with one of the biggest private collections in the world that has been displayed at museums and exhibitions across the country, including during the 2010 Olympics in Vancouver. When the opportunity came up a few years ago to work on a book, it seemed to me an interesting idea that would make for a good read. 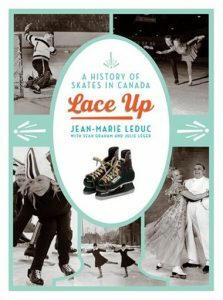 On November 10, Lace Up: A History of Skates in Canada was released. The book traces the development of skates from bone skates used by Indigenous peoples for thousands of years to the skates used by today’s world champions. Through Mr. Leduc’s collection, the book explores how skates and their technological innovations shaped how people got around on ice. At the same time, as skates continued to evolve, new winter sports were invented based on the improved technology. For instance, the development of stop picks on figure skates allowed for the speed, agility, and aerial components required in today’s competitions. In this episode of the History Slam, I talk with Jean-Marie Leduc about Lace Up. We talk about the origins of his extensive skate collection, how he built the collection, and some of his favourite pairs. We also talk about the book, how we put it together, and what readers can expect.